It’s good to keep adding little tricks, the more you can do, the more useful you are. Adding new aspects to his game has been a major focus for Elliott Himmelberg during 2018, with the key forward spending time in the ruck for the SANFL Crows this season. In his second year at the club, after being selected by Adelaide with Pick No. 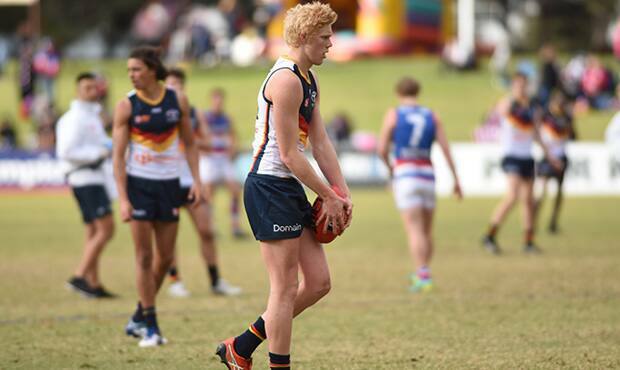 51 in the 2016 NAB AFL Draft, Himmelberg has been one of the main targets up forward for the SANFL Crows this year. While competing strongly up forward, Himmelberg has also been pinch-hitting in the ruck for a lot of the season, while big men Reilly O’Brien and Paul Hunter battled with injury. The opportunity to learn more skills has been extremely important to Himmelberg this year. “It’s good to keep adding little tricks, the more you can do, the more useful you are,” Himmelberg said. “I want to keep continually learning, you’ve got to have a lot of chats with coaches. Basically I’m just trying to get a bit out of each game. “I’ve loved rucking, especially in a struggling side. If the ball isn’t coming down forward, it just brings you into the game a bit. Despite enjoying his time in the ruck, having a strong presence up forward has been a big priority for Himmelberg, who has kicked 19 goals from 14 games, including a career-high five goals against North Adelaide in Round 16. In what was a high scoring match, the Crows went down by 22-points. Despite being disappointed with the result, Himmelberg was pleased to get on the end of the improved ball movement. “It wasn’t great to not get the win, but it was one of the better games ball movement wise, I think we had more inside 50s, double the amount we usually get," Himmelberg said. “ROK (State League coach Ryan O’Keefe) spoke about reward for effort during the week. Himmelberg spends a lot of time with the forwards group and keeps a close eye on senior skipper Taylor Walker and key forward Josh Jenkins. Training standards within the group is something he has prioritised this year. “My main focus has been upholding high standards at training and trying to narrow my focuses going into the games,” Himmelberg said. Approaching the end of the season, Himmelberg is hoping to finish strong in 2018 in order to set himself up for a big off-season. He plans to spend a lot of time in the gym to put more size on his body and be more physically prepared to play next season. Himmelberg and the SANFL Crows are taking on the Eagles at Woodville Oval on Sunday afternoon.